Description: Pungently aromatic mat-forming, prostrate to semi-erect herb to 20 cm high covered with velvety-stellate indumentum. Branchlets with dense stellate trichomes. Leaves alternate, with lamina ovate to rhombic, 8–65 mm long, 8–40 mm wide; petiole 3–45 mm long; upper surface silver-green, venation obscure, lower surface silver, both sides with dense stellate trichomes. 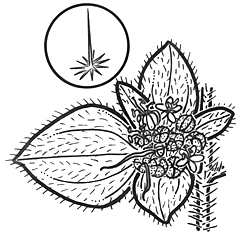 Male flowers 3–4 mm long, sepals valvate, 5, with dense stellate trichomes, petals absent; female flowers 6–7 mm long, sepals absent, petals absent. Capsule oblong, 4–6 mm long, with dense, sessile, stellate trichomes; seed elliptic, smooth, shining, mottled pale grey or cream and brownish or black, caruncle absent. Distribution and occurrence: Naturalised in NSW and Victoria. Also said to be naturalised in South Australia and Western Australia. Native of California, USA. Other Australian states: *Vic. *S.A. *W.A. Previously known as Eremocarpus setigerus (Hook. )Benth.